Oil production in Yemen has for all intents and purposes halted, with no immediate solution for recovery, and uncertainty over whether Saudi Arabia will maintain the flow of free oil to stave off a deepening crisis. But while militant attacks on oil installations have wreaked recent havoc on the industry, more deep-seated problems are to blame. Oil revenues have traditionally funded around 75% of Yemen’s budget and accounted for 90% of total exports. Presently, those exports have been halted, along with most production, as the country struggles with conflicts on multiple fronts, a divided military and a power struggle that has yet to determine who will control Yemen’s oil resources, the revenues from which have long served to buy patronage to a crumbled regime. So far, the Saudis have been supplying free fuel to Yemen in order to avert a worse crisis on its own borders, but the latest free-fuel agreement is drawing to a close and Riyadh has given no indication yet as to whether it plans to continue the largesse. This is causing no small amount of uncertainty in the power corridors of Sana’a. The easiest way to map out the problem with oil is to blame the halt in production on Sunni militant groups linked to al-Qaeda in the Arabian Peninsula (AQAP). Indeed, the number of recent attacks on oil installations paints a clear picture of sabotage. Over the past six months, attacks on oil installations and security personnel guarding these installations have picked up exponentially. Foreign oil workers have also been caught up in the violence, with a British oil worker and two France Total employees killed since December. These attacks have been attributed to groups linked to AQAP, though this, too, is a complex attribution. By most accounts, AQAP itself is a very small and closed group of militants who have managed to buy patronage from a larger network of Sunni radicals operating in Yemen, Ansar al-Sharia. Hadramaut is a key flashpoint in this oil conflict as the main oil-producing region and the site of the Seiyun-Masila basin, which contains nearly 85% of the country’s known oil reserves. Another key flashpoint is the Shabwa province, home to a massive natural gas plant that has been targeted a number of times by Sunni militants in recent months. As the AQAP/Ansar al-Sharia umbrella establishes what it refers to as “Islamic emirates” in these oil-producing areas, production has almost stopped altogether. The Balhaf export terminal has also been sidelined due the ongoing violence, and the pipeline network running from Marib to the Red Sea has been under continual attack since unrest began in full force in early 2011. 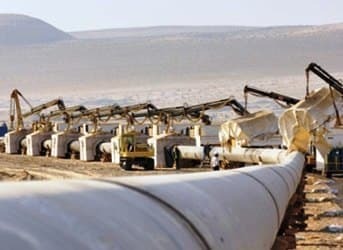 Production in Marib oil fields has halted entirely. Oil infrastructure is also threatened by the military response to the militant takeovers of these areas, with US-facilitated drone strikes targeting areas dangerously close to oilfields and other installations. While it is convenient both for the Yemeni transitional government and the US military forces backing its campaign against “al-Qaeda” to blame the current oil situation on AQAP, this is to seriously simplify the situation. Much of the violence directed at the country’s oil infrastructure is emanating from disgruntled tribesmen who cannot necessarily be associated with AQAP or Ansar al-Sharia. They want employment and regional development and more of their numbers will join Ansar al-Sharia’s ranks if this is not forthcoming. We are talking about socio-economics more than terrorism, and the former informs the latter. Beyond that, to say that Yemen’s oil industry is corrupt to the core would be an understatement. For decades, oil has been used almost solely to fund the patronage system that kept former President Ali Abdullah Saleh in power. Yemen’s new Oil and Minerals Minister Hisham Sharaf Abdullah has arguably the most challenging job in the country’s fledgling, transitional government-in-crisis. The only exports slowly dripping out of Yemen are from Hadramaut and these are also under threat as the locals express their anger at how the new government is handling the crisis. In the meantime, oil exploration has largely ceased altogether, and companies have little incentive to remain in Yemen, and certainly there is no incentive for new investors. Growing ranks of international companies have declared “force majeure”, ceasing exploration and production activities indefinitely. Seeking offshore havens, international companies are leaving Yemen in increasing numbers. But it is not only physical security of oil infrastructure that has them packing their bags or seeking to offload their assets—corruption is rampant and legal arbitrariness makes it almost impossible to operate. Until now, foreign oil companies have benefitted from that corruption, some of them currently the target of investigations by the US Department of Justice for their role in propping up Saleh’s corrupt regime. As for newcomers to the Yemen oil scene, no one is likely to be tempted onto the stage. Legally it is largely impossible, and in terms of security, it is a nightmare. The political system remains in chaos and there is no chance of a resolution in the near term. The only immediate-term solution to Yemen’s oil distress is more free fuel from Saudi Arabia, which is likely to happen as Riyadh cannot afford a worse crisis on its border. Canada's Enbridge and First Nations Tribes - Allies or Implacable Foes?